Turn casual subscribers into paying customers with email automation. All systems set to convert. Join the 100,000+ users that trust AWeber to deliver high-performing emails. Shift your business into overdrive. 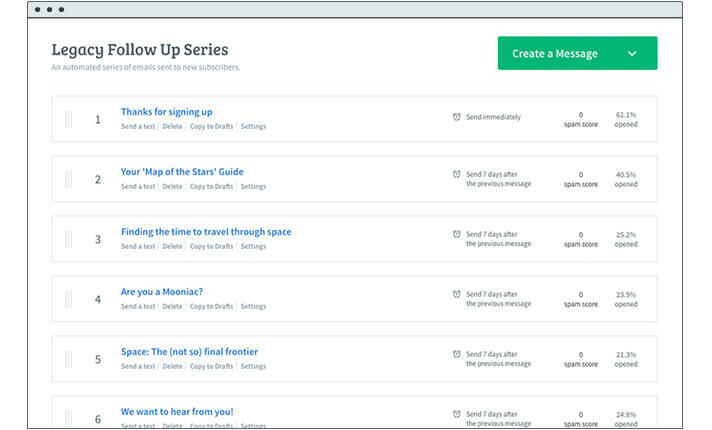 Set up a simple sequence of emails to be sent automatically on a schedule of your choosing. Keep your readers engaged by delivering custom drip campaigns — like a welcome series, product launch series, customer onboarding sequence, or even an online email course. Just as affordable as it is powerful. Send targeted emails to tagged subscribers. Ready to stop working in your business and start working on your business? AWeber’s automation will save you time, freeing you up to invest in other important areas of your business. Do more of what you love. With automated emails, you can build relationships with your audience at scale. Establish trust and credibility, deliver value and build your tribe of raving fans. Track your stats with AWeber’s analytics platform or our free mobile app, Stats. See how your emails are performing by analyzing opens, clicks and engagement reports. Free training and ongoing education. AWeber users get exclusive access to live webinars, automation templates, master class sessions and more from our team of email marketing experts. Or, learn at your own pace by tapping into our massive library of video tutorials.